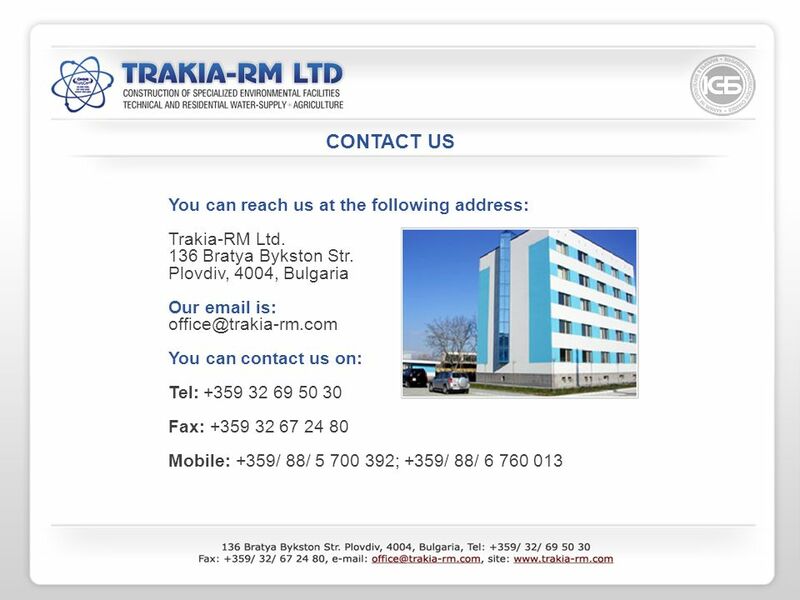 Trakia-RM Ltd. has been a registered company since 1991. We have developed a flexible and effective structure and employ a team of highly qualified specialists. 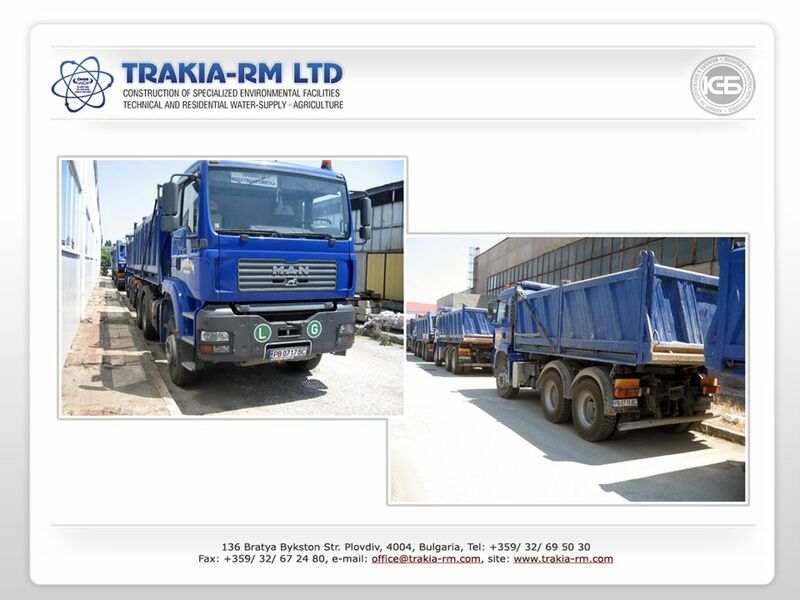 2 Trakia-RM Ltd. has been a registered company since 1991. 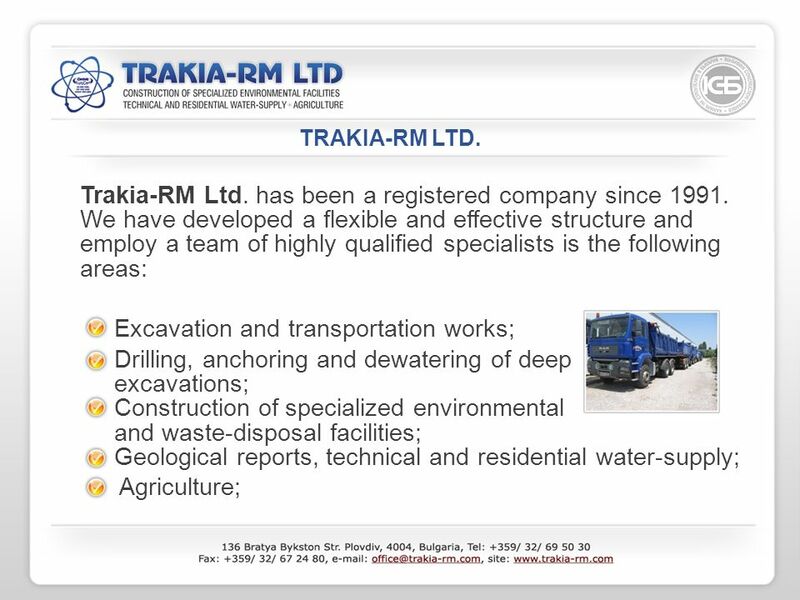 We have developed a flexible and effective structure and employ a team of highly qualified specialists is the following areas: Excavation and transportation works; Drilling, anchoring and dewatering of deep excavations; Construction of specialized environmental and waste-disposal facilities; Geological reports, technical and residential water-supply; Agriculture; TRAKIA-RM LTD.
6 DRILLING AND MANAGEMENT OF WELL SYSTEMS FOR DEWATERING OF EXCAVATIONS At Trakia-RM Ltd. We specialize in water-drilling and management of well systems for dewatering of excavations. 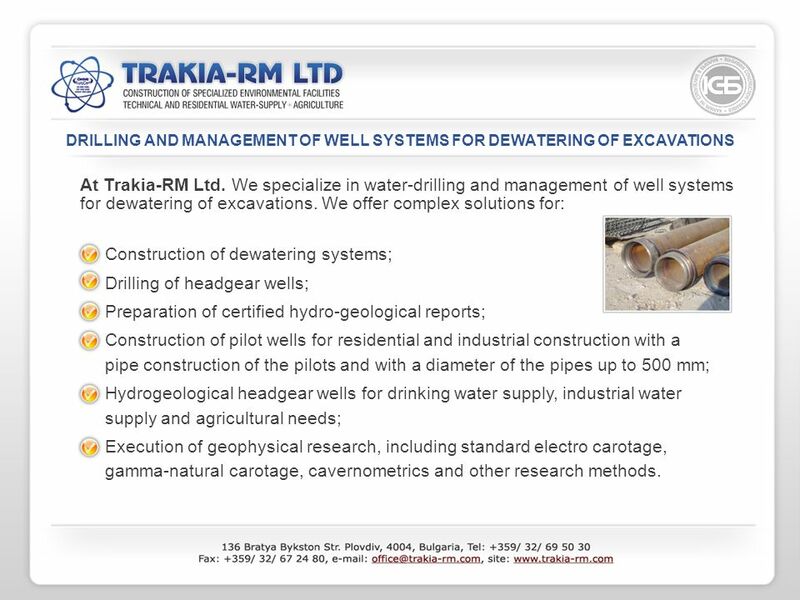 We offer complex solutions for: Construction of dewatering systems; Drilling of headgear wells; Preparation of certified hydro-geological reports; Construction of pilot wells for residential and industrial construction with a pipe construction of the pilots and with a diameter of the pipes up to 500 mm; Hydrogeological headgear wells for drinking water supply, industrial water supply and agricultural needs; Execution of geophysical research, including standard electro carotage, gamma-natural carotage, cavernometrics and other research methods. 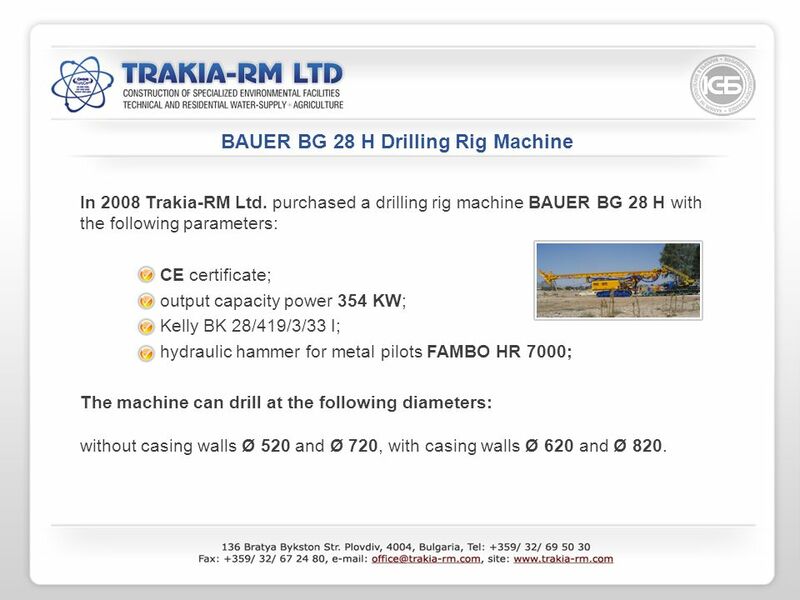 7 BAUER BG 28 H Drilling Rig Machine In 2008 Trakia-RM Ltd. purchased a drilling rig machine BAUER BG 28 H with the following parameters: СЕ certificate; output capacity power 354 KW; Kelly BK 28/419/3/33 I; hydraulic hammer for metal pilots FAMBO HR 7000; The machine can drill at the following diameters: without casing walls Ø 520 and Ø 720, with casing walls Ø 620 and Ø 820. 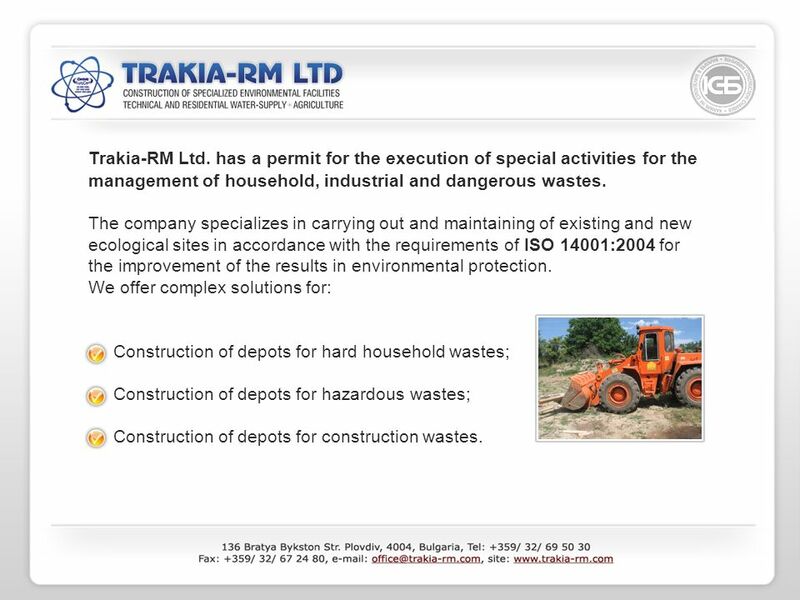 8 Trakia-RM Ltd. has a permit for the execution of special activities for the management of household, industrial and dangerous wastes. The company specializes in carrying out and maintaining of existing and new ecological sites in accordance with the requirements of ISO 14001:2004 for the improvement of the results in environmental protection. 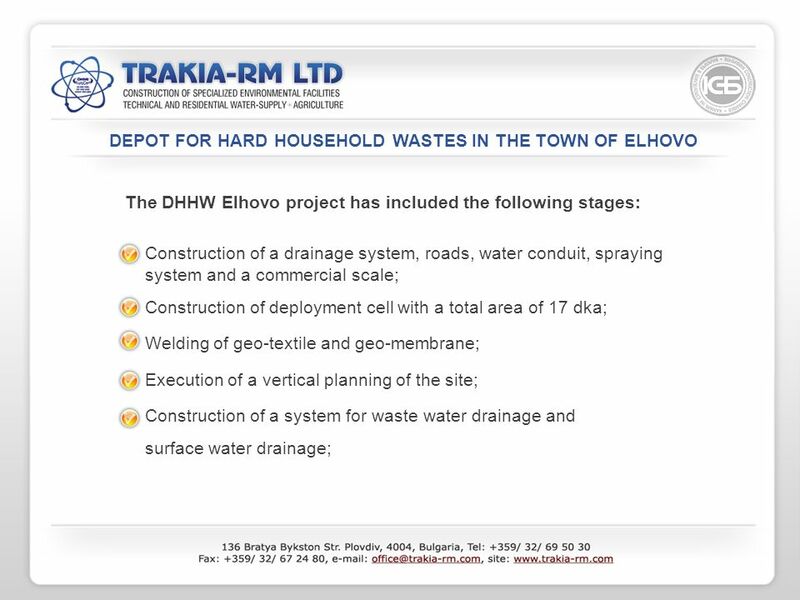 We offer complex solutions for: Construction of depots for hard household wastes; Construction of depots for hazardous wastes; Construction of depots for construction wastes. 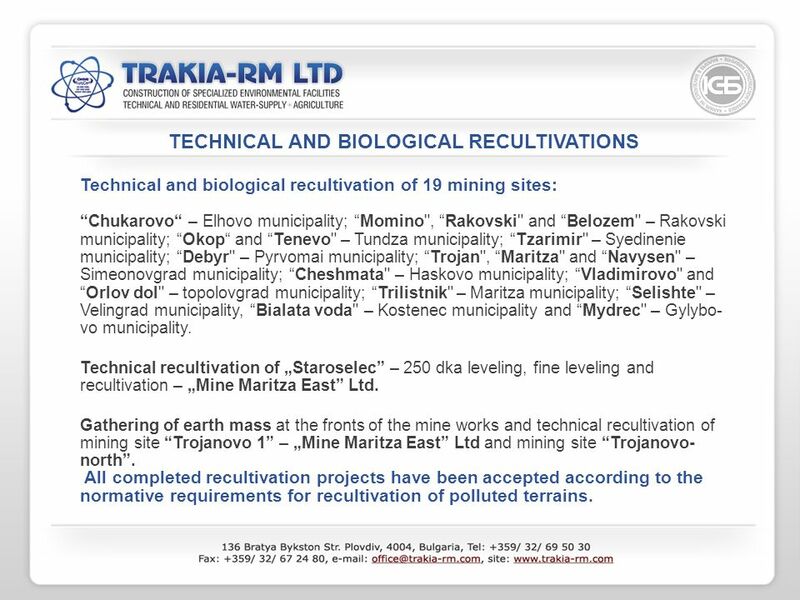 11 TECHNICAL AND BIOLOGICAL RECULTIVATIONS Technical and biological recultivation of 19 mining sites: Chukarovo – Elhovo municipality; Momino", Rakovski" and Belozem" – Rakovski municipality; Okop and Tenevo" – Tundza municipality; Tzarimir" – Syedinenie municipality; Debyr" – Pyrvomai municipality; Trojan", Maritza" and Navysen" – Simeonovgrad municipality; Cheshmata" – Haskovo municipality; Vladimirovo" andOrlov dol" – topolovgrad municipality; Trilistnik" – Maritza municipality; Selishte" – Velingrad municipality, Bialata voda" – Kostenec municipality and Mydrec" – Gylybo- vo municipality. 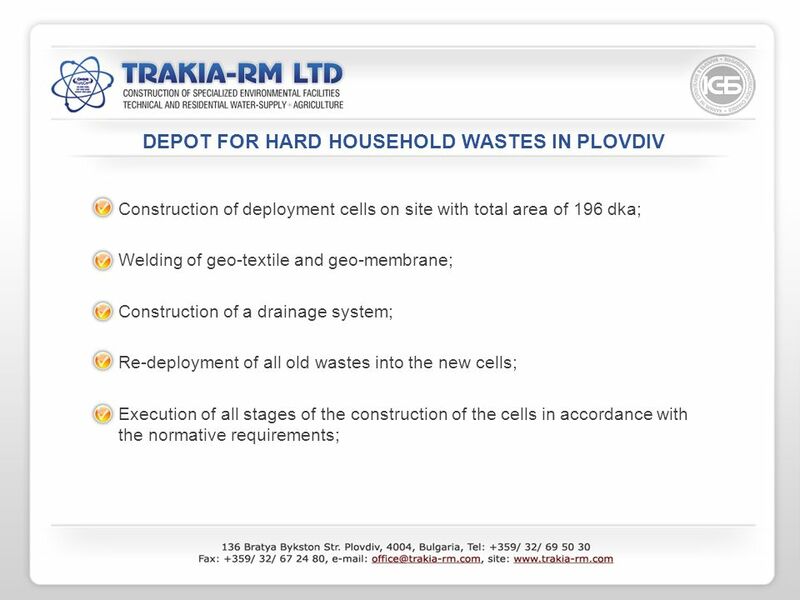 Technical recultivation of Staroselec – 250 dka leveling, fine leveling and recultivation – Mine Maritza East Ltd. Gathering of earth mass at the fronts of the mine works and technical recultivation of mining site Trojanovo 1 – Mine Maritza East Ltd and mining site Trojanovo- north. All completed recultivation projects have been accepted according to the normative requirements for recultivation of polluted terrains. 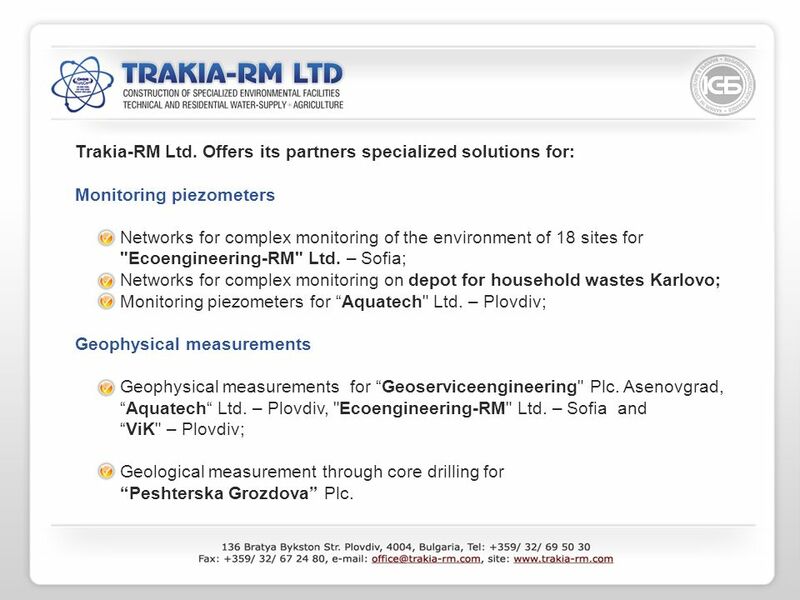 12 Trakia-RM Ltd. Offers its partners specialized solutions for: Monitoring piezometers Networks for complex monitoring of the environment of 18 sites for "Еcoengineering-RM" Ltd. – Sofia; Networks for complex monitoring on depot for household wastes Karlovo; Monitoring piezometers for Aquatech" Ltd. – Plovdiv; Geophysical measurements Geophysical measurements for Geoserviceengineering" Plc. 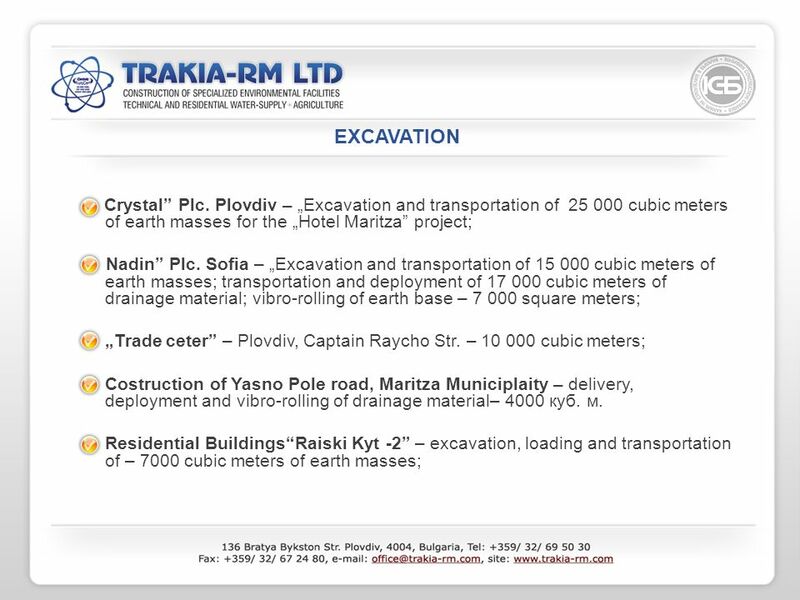 Asenovgrad, Aquatech Ltd. – Plovdiv, "Еcoengineering-RM" Ltd. – Sofia and ViK" – Plovdiv; Geological measurement through core drilling for Peshterska Grozdova Plc. 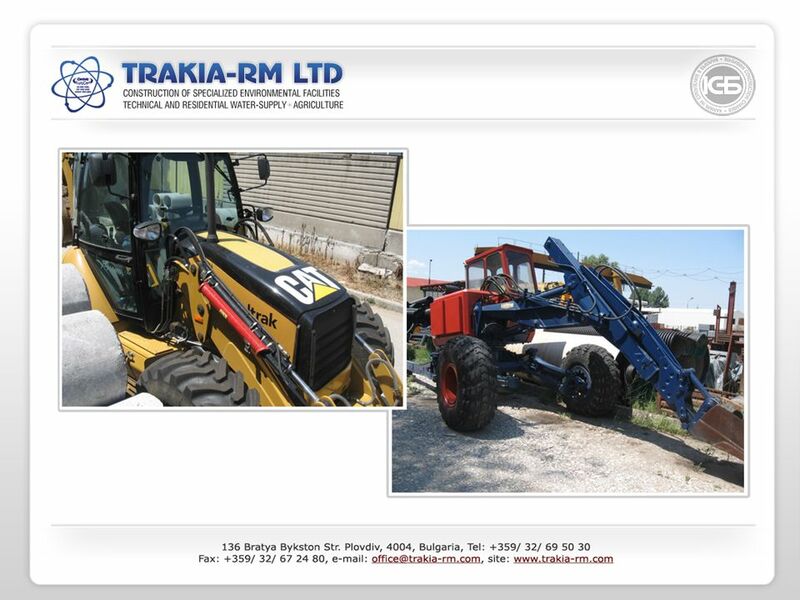 13 AGRICULTURE Currently Trakia-RM Ltd. 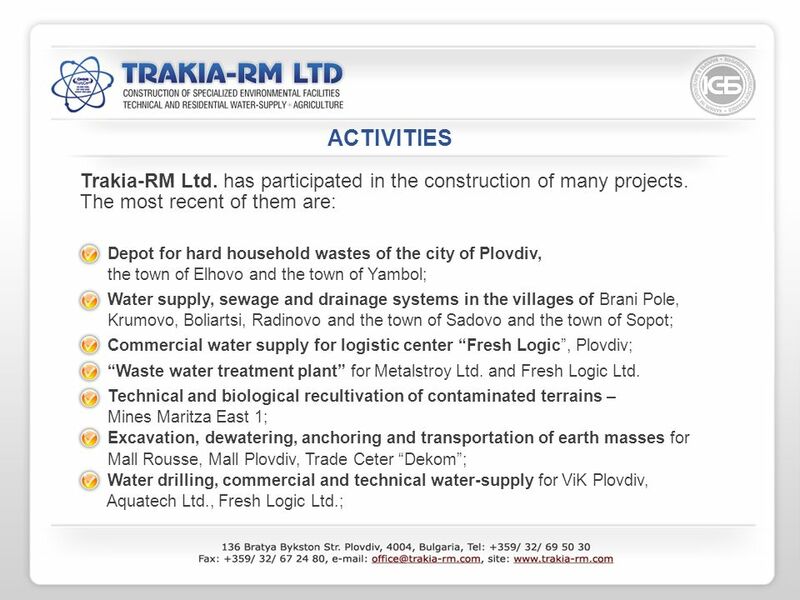 Owns and leases lands in Momino selo, Rakovski municipality and Syedinenie Village, Bratya Daskalovi municipality. 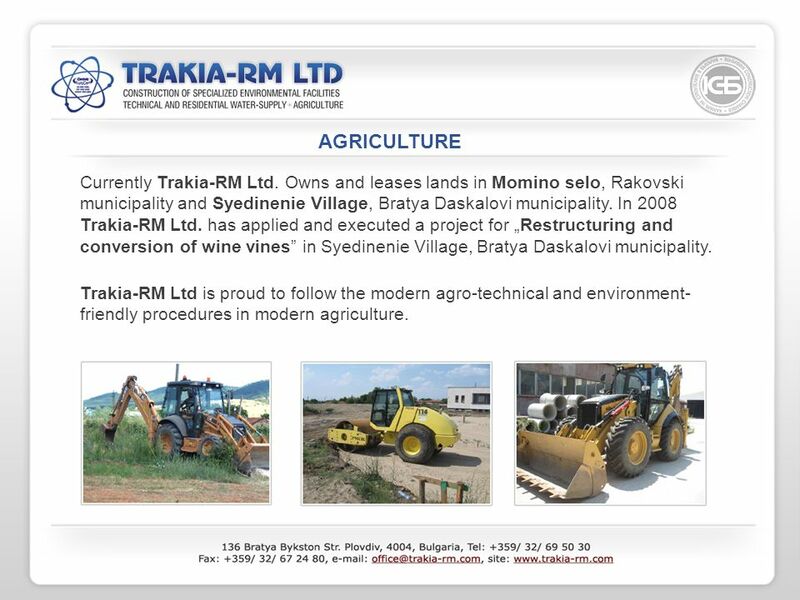 In 2008 Trakia-RM Ltd. has applied and executed a project for Restructuring and conversion of wine vines in Syedinenie Village, Bratya Daskalovi municipality. 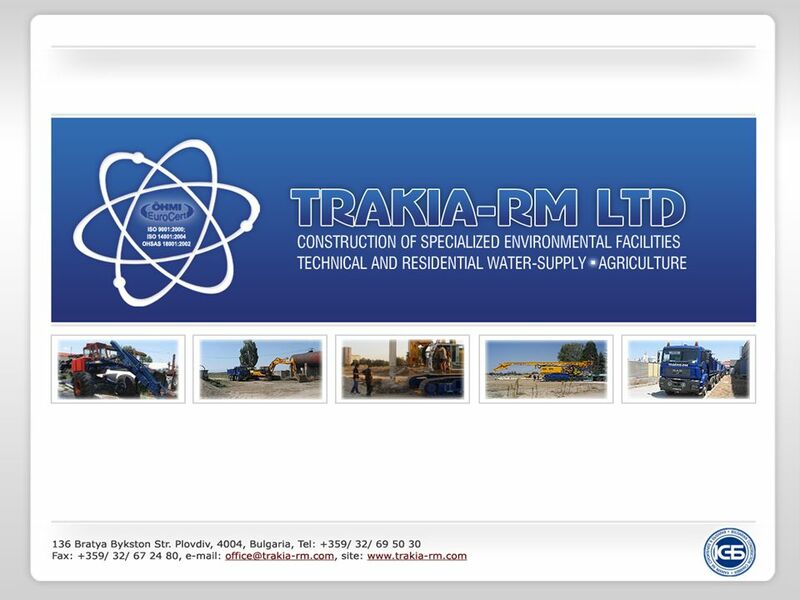 Trakia-RM Ltd is proud to follow the modern agro-technical and environment- friendly procedures in modern agriculture. 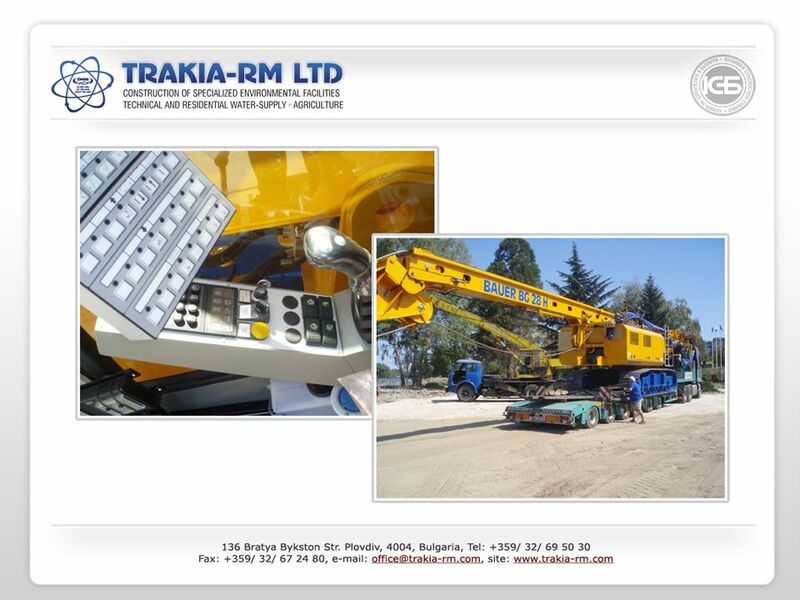 14 Trakia-RM Ltd. Is a registered member of the Bulgarian Construction Chamber, the National Transportation Chamber, the Bulgarian Mining and Geological Chamber and the Union of Quality Specialists in Bulgaria. The company is proud to employ highly qualified specialists and has purchased state-of-the-art machines and technology in order to respond to the needs of its partners. 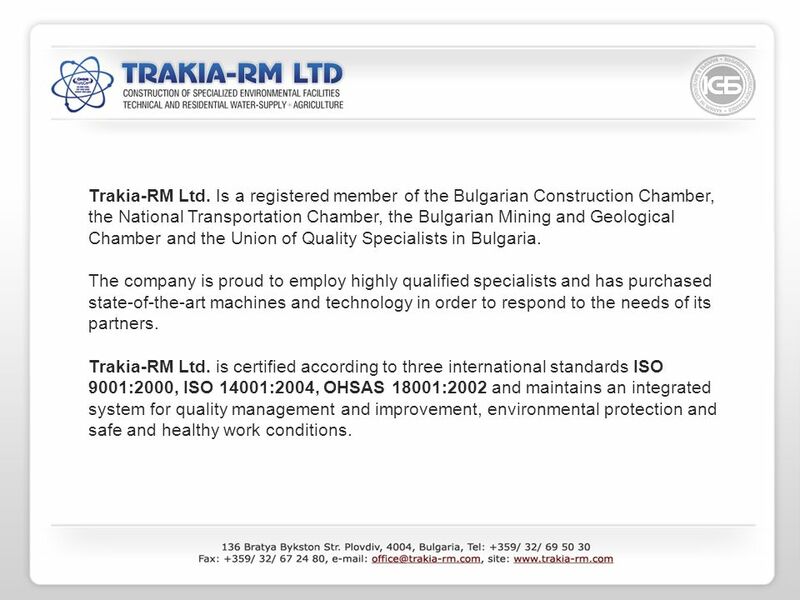 Trakia-RM Ltd. is certified according to three international standards ISO 9001:2000, ISO 14001:2004, OHSAS 18001:2002 and maintains an integrated system for quality management and improvement, environmental protection and safe and healthy work conditions. 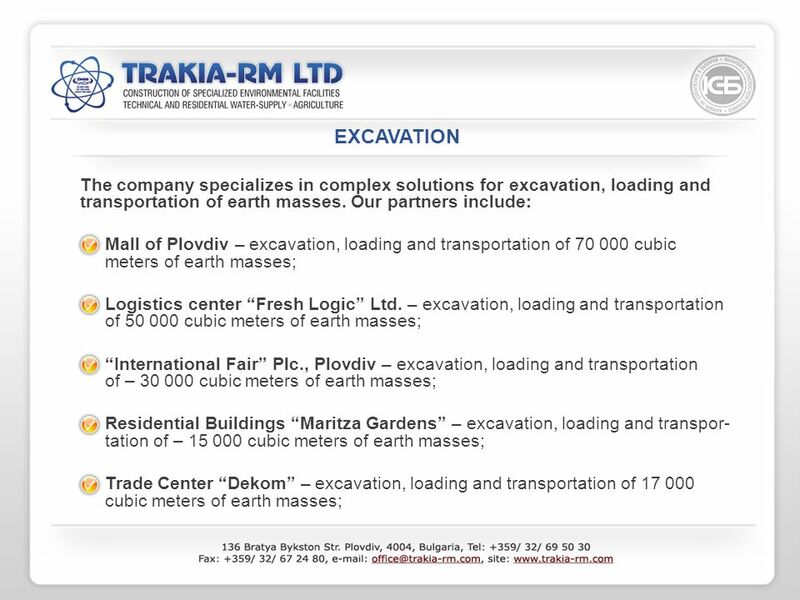 Download ppt "Trakia-RM Ltd. has been a registered company since 1991. We have developed a flexible and effective structure and employ a team of highly qualified specialists." ECOMM 2010, Graz, Solving transport problems in Sofia historical city centre Prof. Lucia Ilieva, CSDCS, BULGARIA. High-Level Policy Dialogue on EU Sanitation Policies and Practices in the 2008 International Year of Sanitation Brussels, 29th January 2008 Rural Development. Global Programme for Sustainable Ship Recycling Dhaka 12 – 13 th January 2008 Mark Gilligan Golder Associates. Mission: Mission: To protect human health and the environment Primary services: Expertise DEC brings to the ACMP Primary services: Expertise DEC brings. CONSTRUCTION DRILLING INC. 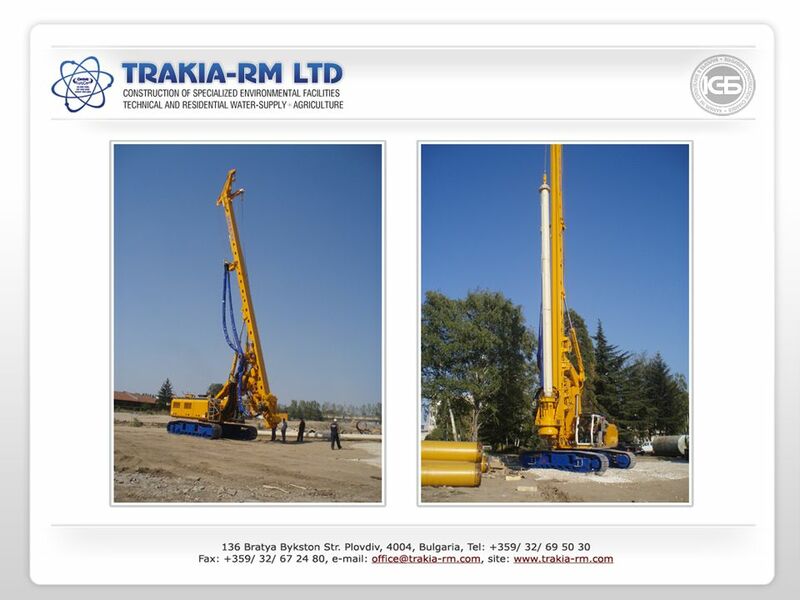 SPECIALIZING IN UNIQUE DRILLING AND CUT-OFF WALL SOLUTIONS. REPUBLIC OF BULGARIA Sofia, 2013 STATE-OWNED ENTERPRISE. 1 WATER AUTHORITY Dr. Or Goldfarb CENTRAL BUREAU of STATISTICS Zaur Ibragimov Water Accounts in Israel Vienna January 2009. 2009 Restoration work experience. Development of STATS grupa Incorporated in 1993 Initial field of activity – construction works Presently involves 10.